Always interested in film and TV, I developed my career in Spain and Germany, where I lived for eight years. I Started to work in TV and fiction films and then turned to non-fiction. I had a great experience travelling all around Europe shooting and editing news and reportages for TVE (Spanish Public Broadcaster) and then I deepened into direction and production of documentary films. I returned to Spain to join the production company elegant mob films as a partner. My lasts films are ‘Copyright, or the right to copy’ a documentary + web project about intellectual property and the project 15m.cc a personal account on the indignados movement in Madrid in 2011. Here you can find my film portfolio (Spanish). Free Culture and copyleft got to me, and then in 2011 the so called 15M movement ended the work. 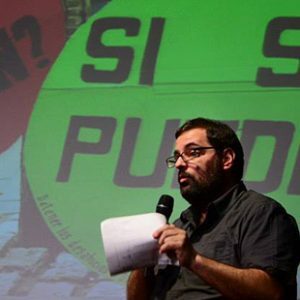 Since then I work and do activism in social issues, I participated in the foundation and am on the board of the PDLI – Plataforma en Defensa de la Libertad de Información (Platform in Defence of the Right of Information) and also do work in the AWP – Associated Whistleblowing Press operating a whistleblowing platform in Spain. For full information, you can find here my English LinkedIn profile. And also here you can contact me.